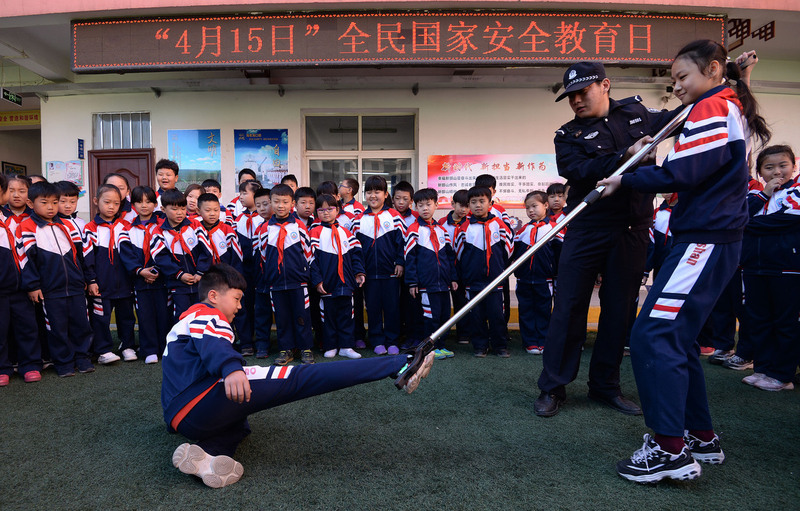 Schools across China launched programs to raise awareness of national security issues on the country's fourth National Security Education Day on Monday. The programs included exhibitions, demonstrations and lectures. "I used to think national security was too serious to be relevant to me," said Jin Zhilei, a freshman at Shanxi Medical University. "Now I am aware it is relevant to everyone, and we should be alert." This year's campaign for the first time included students of continuing education programs. The Open University of China, a government-sponsored online educational institution, launched online courses on national security covering about 3 million students. Yang Zhijian, president of the university, said it has developed a free mobile app for students to learn more about national security. National security education should be carried out with concerted efforts from schools, families and society, and students should be able to learn about national security on a regular basis, not just once a year, Yang said. April 15 was declared National Security Education Day in 2015 by the Standing Committee of the National People's Congress, China's top legislative body. In an instruction issued ahead of the first National Security Education Day at the time, President Xi Jinping said all of society should be mobilized to safeguard national security, consolidate the social basis for national security and prevent and defuse security risks. Wang Zheng, a master's candidate at the School of Mechanical, Electronic and Control Engineering of Beijing Jiaotong University, said university students have the responsibility and obligation to safeguard national security. The university provided instructions to students regarding security laws on anti-espionage and anti-terror as well as information on homeland security, military security science and technology security. The rapid development of internet technology has made information security an important part of national security, and university students should pay extra attention to internet security, he said. Wu Yujun, a professor at Beijing Normal University, said, "Young people who live in a peaceful, stable environment for a long time are prone to think that national security is far away from them. Some lack knowledge about the complicated environment and the serious security challenges our nation faces."